I've recently been going through my huge stash of yarn and in the process coming across all sorts of uncompleted projects. I don't think this is any great surprise to fellow crafters, it's something I think we're all pretty good at (there was a woman at the craft night I used to attend who had a cardigan she had been knitting for 20 years, when she came in wearing the finished garment, the whole group burst in to applause) but I do think I'm probably particularly good at abandoning projects somewhere just past the middle. So in an effort to inspire me to finish them, I thought it a good idea to put them in my ravelry notebook (a lot of these were started long before I joined ravelry!) and blog about them here, therefore making them more obvious to me than when they are hidden inside a big old box of yarn! So here goes, here is the first! The first ever granny blanket I started making, possibly the first ever granny square I made, and certainly the first project I purposely went out to choose yarn for. The original pattern and idea came from Erika Knights 'Simple Crochet', which was also the first crochet book I owned. 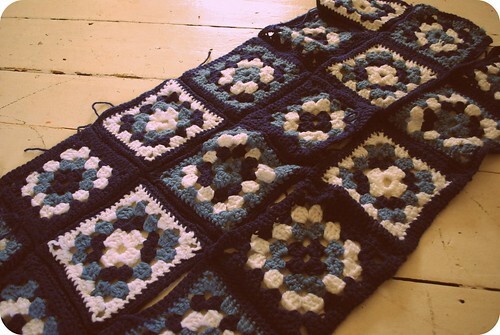 It's not even like there is an awful lot left to do on this poor neglected blanket! 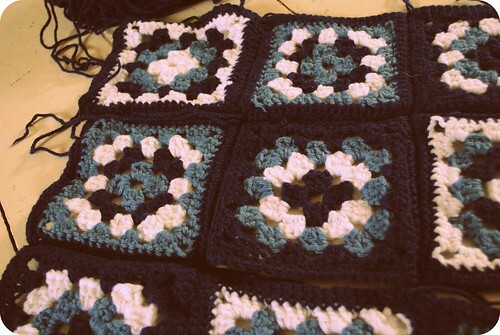 All I need to do is edge a few of the squares in the navy and then put them all together. At some point I've even weaved in all of the ends. Really there is no excuse for this pure neglect! I now even have a little boy who's bed will be perfect for a snuggly blue granny blanket like this, it's very strange to think how much my life has changed since I started it! Last time Milo and I were up at my Mum's, we took a walk around the local museums, which include the RNLI Henry Blogg Museum and the Cromer Museum. Both were great and Milo loved them. 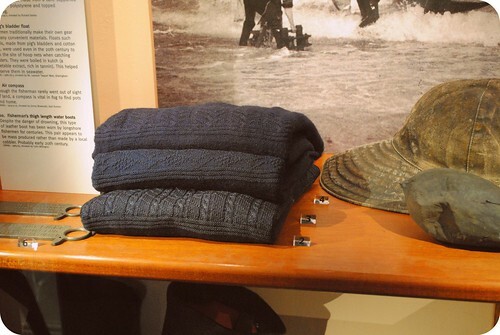 But the thing that must struck me from both was the fisherman's ganseys, I noticed them instantly in the portraits hung around the lifeboat museum and both places had displays devoted to the craft and history of the beautiful yet practical hand knits. There's something so romantic in my mind about this art. I know from my own knitting experiences how lovely it is to knit/crochet for someone else. Every time I've made a gift, whether it be a blanket for a wedding, a pair of socks for a not yet born newborn or a sweater for a niece, I tend to spend a huge amount of the time I'm working on the item thinking of it's recipient. So just imagine knitting up such an time consuming piece, that will become a real staple in your loved ones wardrobe, a hugely important garment to keep him warm out at sea. To me that is such a fabulous thought. 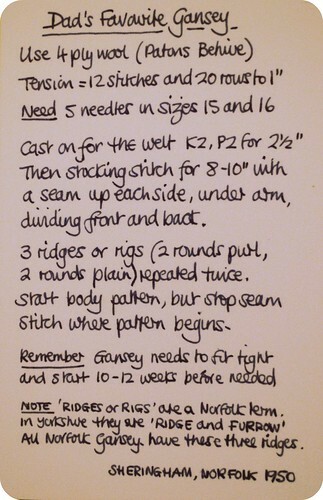 Ganseys were traditionally knit in 3ply wool, in the round on 5 or more needles. They are cast on with doubled up yarn, to give them a bit more strength, then a rib is worked, followed by stocking stitch, up to the armpits, incorporating a column of purls on either side to create a false seam, at the armpits 3 rows of 'welts' or ridges are created with rows of purl stitches, after this the pattern begins. 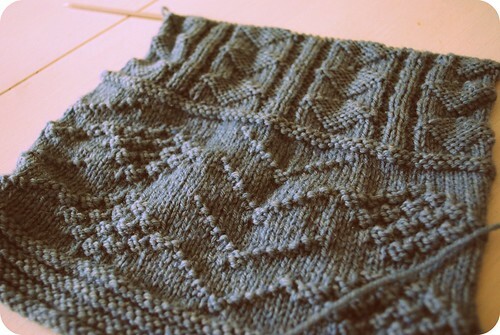 Apparently different seaside towns had their own patterns, but I've read various things that have said many patterns have been discovered in single towns so I expect the knitters just got a bit creative and made up their own. 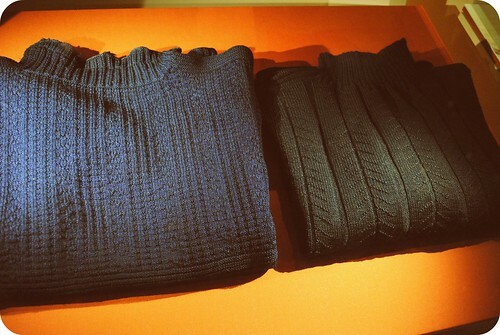 The sleeves are picked up from the body of the jumper and worked down, so they can easily be unpicked and repaired. As soon as I got back from learning all about these fabulous knits I started knitting up some samples of the chest patterns. They looked good enough to inspire me to knit up a full sized version, only problem being I don't have a fisherman to clothe, or even a man who would have any interest in wearing a gansey. However I do have a little man in my life, who would love to be a lifeboat man and still lets me dress him in whatever I want to, most of the time anyway. 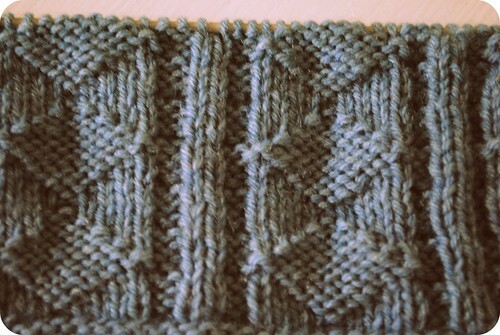 So I've cast on all those tiny stitches (I've never knit a garment in 4ply before, it does seem like so much knitting, even for a toddler sized sweater), I've worked the rib and am about half way up the bottom section, I can't wait to get started on the chest pattern, but I've still got quite a way to go yet before I can think about that! I've also not yet decided which one I'm going to go for, there are so many great patterns in the information I've picked up, but I'm considering the possibility of making one up myself. I have thoughts of robots maybe! I shall keep you updated! A very happy (belated) halloween. I hope everyone was super spooked and treated. Milo and I had a fabulous time. I had thought about throwing a party, but the reality of all that planning was just too much! 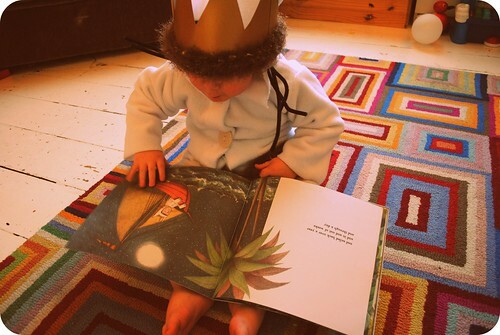 However I did make Milo his very first costume, we decided together to make a costume of Max, from 'Where the Wild Things Are', which is favourite book of everyone in this house. In all honesty it wasn't too difficult to make and I'm quite impressed with the finished piece. 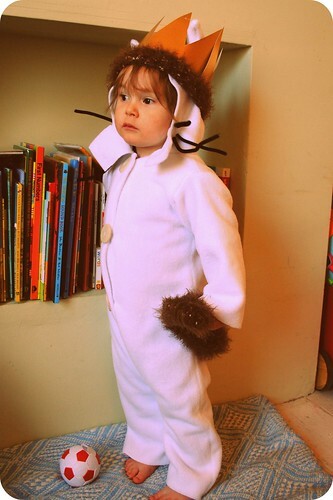 I simply traced around one of Milo's sleepsuits to make the main piece, added a hood, with ears, after reading a few tutorials on the subject, sewed in some whiskers (made from pipe cleaners). Then I bought some furry yarn to crochet the tail and the fur trim on the crown, it almost certainly would have been easier to use furry fabric for this task, but the craft shop didn't have any in a suitable colour. For the crown we very simply used an A4 piece of gold card, cut in a zig zag and stuck together. There was going to be feet and hands and scepter, but you know sometimes life gets in the way of all these wonderful plans! Either way Milo loves it and had a great time trick or treating with the other boys in the street. We did have a last minute realisation that we had left Milo's crown on the postman pat van at the supermarket! Literally 10 minutes before we left the house, fortunatley I had some left over gold card, so we whipped up another one and stuck a few strands of the furry yarn around the edge! Not as good as the original but better than nothing (the pictures are with the original crown).